I quit my life or I should say life quit me. On the outside, I had it all, big house, big job, loyal husband, treasured teenage daughter in private school, but I felt trapped, stuck on the relentless treadmill of the pursuit of “success”, all the while dreaming of a life of adventure, travel and freedom. I met someone new, and made the difficult and life-altering decision to abandon my comfortable life, leave my marriage and jeopardize the relation ship with my beloved daughter. Just one month after my only child went off to college he died of a heart attack. In a state of total upheaval and still in the midst of a mid-life awakening, I embarked on a spiritual journey to figure out what to do with the “second half “of my life. I liquidated my home and rented it and reduced all my monthly living expenses to 3 bills, cell phone, health insurance and small storage unit. My journey goes from Alaska, to the Caribbean and then to my beloved Italy. From the boat, I rented a room from a local woman I found on the internet in Tuscany. I didn’t speak the language or know anyone there, but it was the place I had always dreamed of living. Just 10 days after my arrival, I went to a little family winery, met Giuseppe, a young handsome third generation wine maker, fell in love and spent the rest of the summer riding the hills of Chianti on a Vespa. 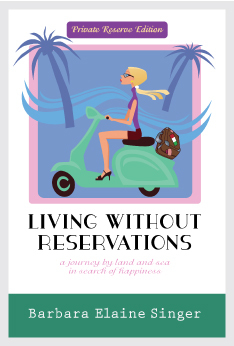 Now, I still have just 2 suitcases and computer and I turned my journal into a published book became a certified life reinvention coach after readers started to ask me to help them make the transition and do speaking engagements. My latest adventure is hosting a “Life Reinvention Retreat” at a 1000 year old monastery to share my knowledge and this magical place I call home. I never dreamed that in such a short period of time my whole life could change. Some people say it takes courage to do what I did. In my eyes, the worst thing that could ever happen to me, already did, so I went about living with a whole different perspective. It was also the best thing because it lit a fire under my chair and that if I have dream or a goal, I better move on it- yesterday, because in a snap, it’s GAME OVER. I never dreamed that my life could be so full, exciting and filled with joy. And I want the same for you. I can show you how. Is it time to reinvent your life?